Who said that Biafrans are not formidable? This day, the 22nd of December, 2016 marked another victory for IPOB. Buhari has again cancelled his visit to Biafra land just as he cancelled the Ogoni visit because of fear of Biafrans. I thought that Buhari is a Hitler, I thought that he is a strong man who can never be defeated. I never knew that he fears to the extent that since he assumed office since one year and seven months ago, he has not set his feet into Biafra land. I remembered when the news was all over Nigeria that Buhari is coming to clean Ogoni land, but later he cancelled that trip because of security reasons and he sent his house boy, Osibanjo who is the Nigeria deputy president. It means Osibanjo is the one that is supposed to die. Very pathetic! Today again, Buhari has cancelled his visit to Enugu for the same security reasons, so he is afraid to die, but he is not afraid to kill innocent Biafrans. The fact there remains that IPOB has recorded yet another victory today whether Buhari come to Enugu or not. 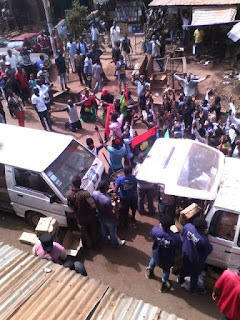 And it has entered into record that today, being 22nd of December 2016, IPOB embarked on a mega protest in Enugu to resist the coming of tyrant Buhari, the president of Nigeria. After killing our people in Enugu and some other places in Biafra land, Buhari wants to visit Biafra land. He should go and thank his God for not setting his feet in Biafra land, if not it could have been a different story because Biafrans have not forgotten the massacre of their brethren who were killed by the Nigerian military at the order of tyrant Buhari. Buhari should also have it at the back of his mind that the spirit of those people he killed will continue to torment him till he enter into grave. A sinner always runs when no one is pursuing him they say. Buhari is now only a northern president because it is only the places he is used to visiting. I remembered when Good Luck was the president of Nigeria, any time that there is a bomb blast in the northern part of Nigeria, he must surely visit the place to sympathise with them. He is not selective in his visitation during his regime because he has no skeleton in his cupboard. He is the president of all Nigerians and not to South only; But Buhari who has PHD in killing from time to time is always afraid to come to the Biafra land because he has done what is abominable against man and divinity. Now because of fear of the atrocities that he has committed on Biafrans, he finds it difficult to visit Biafra land. As far as Biafra is concerned, we only do what its leader mazi Nnamdi Kanu commands. So the earlier Buhari allows Biafrans to go, the better for him. Because for two different government to operate in a country is questionable. Finally, whether Buhari like it or not Biafra must surely go. We thank Chukwu Abiama that today, we have recorded another huge victory. Halleluja!! Biafrans those has demonstrated in Enugu are really heroes. The Cowardize Zoopresident Muha-MAD Buhari fears Biafrans. 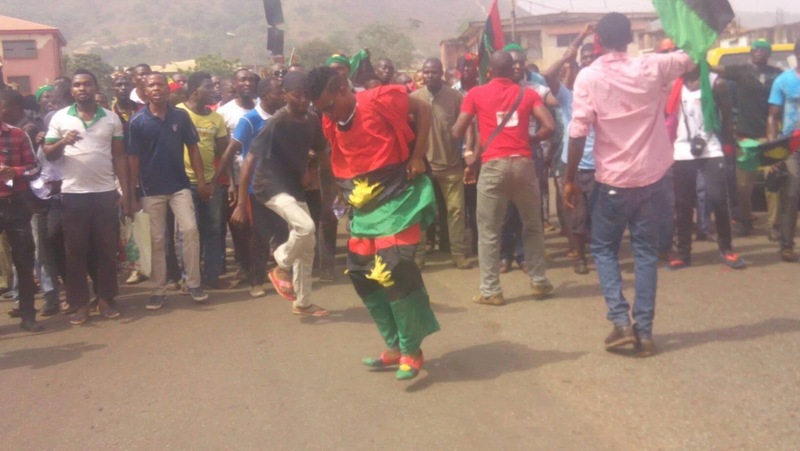 This loughable Idiot and Zoo-president didn't put even one leg inside Biafraland. Biafrans BIKU rise up all flags to the sky to show the world how great you are. ALL HAIL BIAFRA!!!!! Biafrans should be well congratulated and be held in the highest esteem. They should be commended for making things easier for those idiotic cowards they called Niger-areans. If they are intelligent enough, today's exercise should show them that Biafrans are making their final steps into our amiable, God given land. All Hail Biafra! 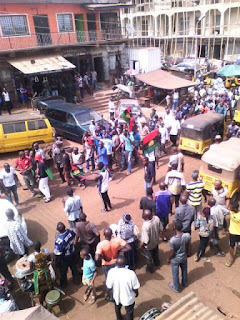 The Sept 23 sit-at-home order by IPOB leadership which was hugely successful and today, Dec 22 massive protest against Buhari visit to Enugu for Economic and Security Summit, who chickened out because of serious warning by IPOB leadership that he Buhari is not wanted in Biafra land is an indication that Biafrans are formidable and united. Leadership. Again, kudos to IPOB leaders! Kudos to Enugu IPOB and kudos to all Biafrans who descended in Enugu today. So proud of all of you. Biafra is here. All hail Biafra nation.